Over the years, Patrick McDonough participated in a learning-to-run group where he completed several 5k and 10k races, plus two half marathons that left him completely exhausted. When it came time for him to retire, Pat was a self-described “couch potato with a plethora of medical issues,” and wanted his new “job” to be focusing on getting healthier. Two years ago, Pat became a new member at the Woodbury Y. When he started, his goals were to lose 50 pounds, increase strength to help with running, improve his 5k time and visit the Y at least four days a week. When they meet each week, they review Pat’s marathon training plan, track his progress on running pace, and create new cross-training workouts that include yoga, strength training and self-myofascial release with foam rollers. “I tell Stacy that she is my hero. 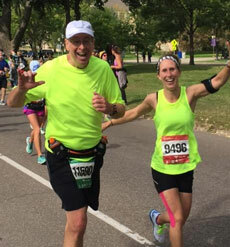 I really enjoy working with her and she has helped me reach every goal we’ve ever talked about.” Pat is excited to run with Stacy in the marathon and looks forward to setting new challenging goals to tackle with her post-race.